The Fisher F22 is a fantastic update to the classic Fisher F2. 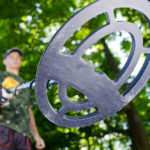 Every modern feature that beginner and intermediate metal detector users could want can be found with this model. Metal detectors come in many shapes, sizes, price points, brands, and feature lists. Depending on your personal needs, you’ll need to sort through them. 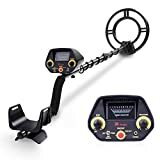 This Fisher F22 Weatherproof Metal Detector is a starter metal detector that has a mid-range price point to reflect the more advanced features that it comes with. The complexity of those features, and how beginners can use them easily will be further outlined in our review today. 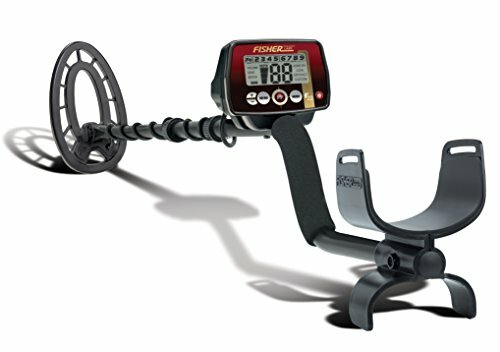 This Fisher F22 metal detector is an updated version of an old classic: the Fisher F2. When the F2 was released in 2007, it immediately skyrocketed to the top of the metal detector world. The F2 is still a great starter metal detector, but now, the F22 takes those starter features to the next level with more modern technology. The result is absolutely amazing. Fisher is a high-quality tech company that takes the time to review their products, consider customer feedback, and improve them. The F22 is an example of that process. While the F2 was and is a great product, Fisher knew that the metal detector community would appreciate something even better, so they set out to create it themselves. The result is something beautiful. 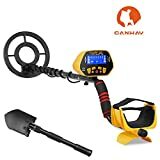 While you might gape at the price point, remember that intermediate level and advanced metal detectors cost well into the thousand dollar range. This detector is definitely more expensive than a run-of-the-mill detector, but it is also more updated and advanced. Features that you wouldn’t imagine that you could find in a starter metal detector, such as custom search tones, interchangeable search coils, and a menu interface, are all well-implemented in the F22 metal detector from Fisher. And today, we’ll give you the full details on just what that means for the detector in action. The Fisher F22 was released as an update to the Fisher F2 in 2015, and since then, it has been winning a lot of recognition as a great model for both beginner and intermediate members of the metal detecting community. Due to the comprehensive features, there is a lot that you can do with it, but it remains straightforward to use. At its core, the Fisher F22 is designed to be a “plug-and-play” style of a detector for beginners and intermediate hunters that prefer to focus on the hunt and not on extensive equipment. With this device, you can easily locate coins, jewelry, small relics, and other little objects. Searching for things like gold nuggets, on the other hand, is best left to higher-end detectors. One of the most interesting things about this model is the unique 9” coil. Rather than being shaped like a circle, this model has an elliptical coil. This makes it easier to discriminate the items that you want to find away from others while pinpointing a location, and it also makes it easier to navigate in tight spaces that a round coil may have had trouble with. Another huge bonus of this model is the incredible LCD screen. This screen really puts others in this price range down because it has so many unique things available to you clearly on that screen. With all of those items easily accessible and visible on the LCD screen, you’ll learn very quickly about what you are finding, how to improve your findings, and even what type of things are most common in the area where you are searching. All of this will make you a better adventurer! If you are already familiar with the F2, then you are already familiar with a lot that there is about the F22. Many of the features that were in the F2 were simply optimized, while some were changed entirely. We should mention now that while the entirety of the F22 is weatherproof, only the coil is submersible. If you submerge the control box, it will be ruined. If you were already happy with the F2 but are looking for something a bit more modern, upgrading to the F22 makes sense. In addition to having higher accuracy ratings, you will also get all of the above features when you upgrade, so you will have a high-quality detector that can really work for you. As this is a model that mostly fit both beginner and intermediate users, it is a bit disappointing that it doesn’t offer manual ground balance. Instead, you will need to rely on the presets, which can make searching for more rare metals impossible. Another drawback is that the depth finder is not as accurate as some less expensive models. The Fisher F22 Weatherproof Metal Detector is not without its faults. Like any product, there are going to be some drawbacks that you must take into consideration. Sure, the depth is off sometimes, and you cannot manually ground balance. Do those drawbacks make it a no-go? No, they do not. 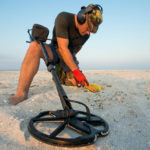 Regardless of those drawbacks, it is clear that the Fisher F22 is a fantastic starter metal detector that will work for beginners and last well into their years as an intermediate metal detector hobbyist. This upgrade from the classic Fisher F2 is an excellent investment for many purposes, and we highly recommend it. to say that this write-up very compelled mee to check out andd do so! It will help me to write more. Thanks a lot! We are happy to hear from you. We will continue this effort to resolve the problems that people face every day. I am not sure where you commented. However, you can change the notification setting from your devices. I’ll try my best to help you. free to sjoot me an email. I look forward to hearing from you! Wonderfuul blog by the way! I appreciate you for your interest. I’ll let you know after. us so I came to chek it out. I’m definitely loving the information. I’m book-marking and will be tweeting this to my followers! of writing posted at his web site is in fac pleasant. We appreciate that you read every day. I have read all that, so now me alsoo commenting here. of things from iit concerning blogging. thanks. I’ve a undertaking that I am just now running on, and I have been on the glance out for such info. Some recommended products may use affiliate links. TheMetalSearch.com is a participant in the Amazon Services LLC Associates Program, an affiliate advertising program designed to provide a means for sites to earn advertising fees by advertising and linking to Amazon.com. Amazon and the Amazon logo are trademarks of Amazon.com, Inc or its affiliates.